See how to sync FileMaker patient appointments with your Apple Calendar (formerly known as iCal) AND include a URL that will automatically open a database and run a certain script with a specified parameter! Zulu 3 videos are here! Learn how to integrate FileMaker with your device calendars, hosted by Senior Developer, Joe Martin at 360Works. On Wednesday, January 30th, 1pm EST Joe Martin, Senior Developer with 360Works, will demonstrate how 360Works Zulu can help you publish calendars from FileMaker to Apple Calendar, Google, and Exchange! Learn how 360Works can help you with Amazon Web Services. See Ryan's (Support Lead at 360Works) awesome work on and offline! Take 15% off your online order December 17 and 18, 2018! Learn how to identify text and faces found in images and pull the data into FileMaker with Senior Developer, Joe Martin! Save the date! 360Works is having a sale on all FileMaker plug-ins and add-ons (all products) bought at 360works.com December 17 & 18. Check out what's new in the ultimate FileMaker deployment tool... 360Deploy! Something cool you can do with the 360Works Email plug-in is add two-factor authentication to your FileMaker solution as an extra challenge to the user! Learn more and test out our demo file in this article. Tap into the AWS universe of services; Jesse Barnum will show you how to do interesting new tricks integrating AWS into FileMaker! Senior Developer, Joe Martin, walks through the 360Deploy set up in this video at the Houstin FileMaker Meeting. 360Deploy 2 automates your process of making FileMaker changes and migrating the data to a live or production (PROD) database. See the top 3 ways MirrorSync 5 provides better usability! Check out what we did at the FileMaker Developer Conference this year and grab your code for 15% off through 8/17! We are ready for the FileMaker Developers Conference 2018, here's a discount to celebrate. Check out Richard Carlton's recent DevCon update and his first thoughts on 360Deploy 2! Here's how to backup FileMaker... now with refined and reduced pricing. See the new major version of 360Deploy 2 in action! Authorize.Net will be disabling TLS 1.0 and 1.1. If you are using the Plastic plug-in to process payments in FileMaker, you'll want to be sure you're running major version 3 which supports TLS 1.2! We made significant improvements to plug-in stability when running in FileMaker Server on Mac, Windows, and FileMaker Cloud. We also made various improvements to plug-in functions with progress bars and dialogs, along with specific fixes for the Email and ScriptMaster Plug-ins. Important update now available, featuring compatibility with macOS High Sierra and several usability fixes. Need to sync a solution hosted on FileMaker Cloud? We've got you covered! Review the slides and the demo video from Jesse's presentation here. With your help, we have raised $40,000 to help the people of Puerto Rico and the US Virgin Islands! Hurricane Maria left immense devastation on Puerto Rico and the Virgin Islands. 360Works is having a one-day sale and giving 100% of proceeds from our plug-ins and add-ons to relief efforts on Friday, September 29, 2017. It's here! Introducing #painlessrollouts with 360Deploy - enjoy automated, simple FileMaker database updates to your production server. Introducing painless, automatic downloads for your users like never before with MirrorSync 4, plus a great DevCon discount deal through 8/9/17! SafetyNet 2 is now available with software improvements and compliant with the latest AWS updates! Major version upgrade for all 360Works plugins and FileMaker 16 compatibility! Read more in this article. Thinking about running FileMaker Server with Amazon Web Services? Listen to Jesse's tips first! See how to cluster #FileMaker Server in a video by Richard Carlton Consulting and the latest updates in MirrorSync 3.17. Improvements to installation, accessibility, and thumbnail image generation have been made in SuperContainer 2.94. Read more in this article. See how IMS uses MirrorSync in a FileMaker custom app for emergency responders! MirrorSync 3.16 is now available with many reliability improvements! Changes are being made to MirrorSync support beginning January 31, 2017. Read more in this article. MirrorSync 3.1 is now available with many important improvements and compatibility with FileMaker Cloud! Learn more. Sync FileMaker with other data sources like never before with the latest version of 360Works MirrorSync, which now supports syncing FileMaker with Salesforce and Amazon RedShift, as well as new support for multiple configurations per database, and tremendous speed and redundancy improvements. Enjoy a few more days of 15% off of 360Works products. MirrorSync 3 is in the works! Heard about MirrorSync and just haven't found the time to get it set up? At DevCon 2016, we are taking care of the setup up for you, read this article to learn more. Heard about MirrorSync and just haven't found the time to get it set up? At DevCon 2016, we are taking care of the setup up for you! Looking for a quick way to get a comprehensive FileMaker solution up and running? Using a couple of 360Works products? Check out these 4 perks of the Portfolio Bundle and learn why it may be right for you with this infographic. Watch how you can send email blasts from #FileMaker and analyze website traffic from your email sending. New improvements with Excel, image retrieval and replacement and document management in Scribe 2.15! Learn how CloudMail 2.0 automatically works with Google Analytics to provide insights on key metrics important to your business. Added features and improvements! Check out the newest version of Zulu. We have launched MirrorSync 2.506! Read about the new improvements to user experience with better error reporting and improved performance. If you have already updated to OS X 10.11 El Capitan and are using 360Works plugins, read on. Where you can download the Apple Java installer. 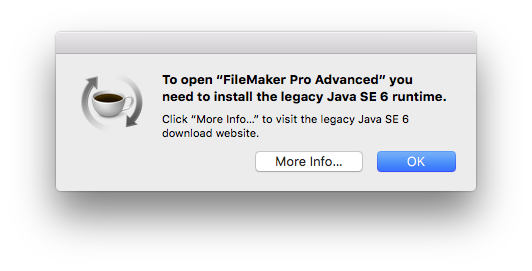 Use this installer to re-enable Java 6 on OS X 10.11. MirrorSync is gaining momentum in a big way. We've been signing up customers and supporting them through successful deployments of MirrorSync for over three years. A little less than a year ago* we started to keep usage statistics, and today we?d like to share some highlights with you! We will keep making MirrorSync the fastest and easiest sync solution for FileMaker, all we ask from you is to help us get to the next milestone! Of all of the new features in the recently released FileMaker 12, one of the most significant is the inclusion of enhanced container fields with managed storage. These enhanced container fields offer users a simple solution to store container assets outside of the database file in order to avoid increasing the size of the database file itself. Solving this issue was the driving force behind the development of 360Works' SuperContainer, a server application that leverages FileMaker's Web Viewer to manage digital assets from your FileMaker interface. In this article we'll compare the unique features of both FileMaker Enhanced Container Fields and SuperContainer so that you can make an informed decision for your solution. This tutorial video describes how to run credit card transactions from FileMaker Go using the 360Works Plastic plugin. The transcript is attached below, and the video can be watched on YouTube at http://www.youtube.com/watch?v=qrOucBq6HHg. This tutorial video describes an example of using RemoteScripter to create a PDF in Instant Web Publishing. The video can be viewed on YouTube at http://www.youtube.com/watch?v=jiNWKGSvI9o. The transcript of the video is provided below.